and to sort the different denominations into different boxes. ·Count and sum the total value of all denomination or each denomination. ·Count and sum the quantity of all denomination and each denomination. ·Pause automatically in case of the drawer filled with coins. ·Elegant and portable design suits convenient movement. 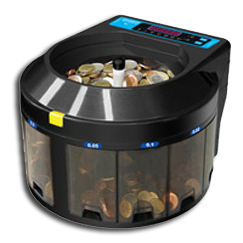 ·To accurately count and sort all the coins mixed at one time, and to sort the different denominations into different boxes. 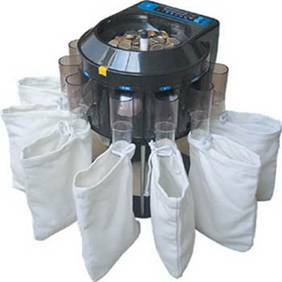 ·Using bags, store more coins.